Supply and Demand of Gas(oline) - Miata Turbo Forum - Boost cars, acquire cats. It seems most news outlets have it all backwards. I keep seeing articles toting "Consumers switch to high efficiency vehicles as gas prices soar!!!" While this may be a true statement, I can't help but think the opposite: gas prices are soaring because the government is pushing extreme regulations for increased fuel economy and gas demand is flattening or decreasing. Isn't this economics 101? Isn't it an oxymoron for politicians such as Obama to push increasing fuel efficiency standards while at the same time claimin that the can reduce fuel costs? Why would the price of something go up when demand decreases? Umm look outside of the US, demand for fuel is sky rocketing. Remember the 70s when they tried to price fix gas? No, I was not alive. no excuse. remembering the faults of the past ensures the rights of the future. So does sacrificing newborn babies. So, where is this thread going to go? I'm curious to see what wild turn it takes. i dunno. gas is $4.11 for 93 here now. Dont not like. I'm thinking price increases to sustain profits and cover operating expenses. If I know I need to sell 1000 gallons at $4.00 to break even, then I'll need to sell 900 gallons at $4.44 to break even. This may be unconventional thinking in selling consumer products, but it seems more relevant for essential commodities. If ten people want to buy a razorblade diaper at $5.00, it's less likely that five will want it at $10.00. But the same people will probably keep paying a garbage man to take the dirty diaper away if the cost of garbage services doubled. I'm looking for a 1997-1998 Jetta or Golf TDI with a manual transmission. gas prices dont follow logic there's never a decrease in demand for gas/oil. One day I tried to figure out how gas pump prices work out, I ended up a few hours later looking how bees turn pollen into nectar/honey. I'll try to come back to this thread with more detail, but I think Braineack's last comment is probably incorrect (depending on whether your "gas" = gasoline or natural gas). US oil imports peaked in 2005 or 2006 as I recall. A combination of things affects US demand: huge supply of nat gas that is now economically feasible to extract, fuel switching between power plants and commercial vehicles, broad fleet efficiency increases, reduced miles driven, etc. As for pricing, it's a combination of (A) oil, and thus, gasoline is a global commodity which is represented in the WTI to Brent crude spread and (B) the commodities markets have been massively financialized over the past decade or so. Also, (C), (D), and other misc things I am forgetting or unaware of. I posted an image for demand, not production. anyways, i dont even try to understand gas prices. nor do i care. Here it is: Gas prices have skyrocketed as a result of several factors. 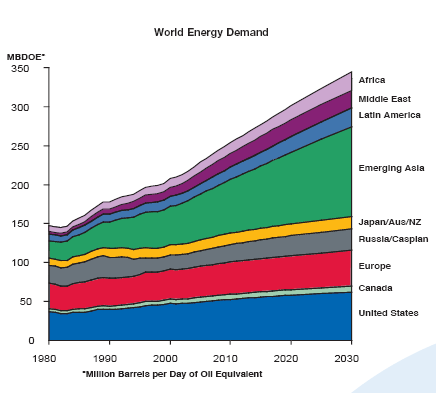 The most obvious is a striking increase in global energy demand over the last two decades. Economics 101 says that as demand increases, then price will also increase - not the other way around, as the OP suggested. The OP has confused supply with demand. The second reason, and less obvious, is that the rate of increase of production of oil has not matched the rate of increase of consumption of oil. In the US, a lot of our oil comes from Canada, and some domestically. As the price of oil rises, the willingness for oil companies to add capacity increases, which naturally raises production and allows prices to settle again. A problem here arises with the fact that an oil company can't just go out in a boat and set up a drill platform and call it a day. There are government regulations that the oil company must comply with in order to be allowed to set-up a drilling and pumping operation, and once the oil company has complied with all of those regulations, they're at the mercy of a government agency to give them the stamp of approval to "go ahead and drill". In the wake of the latest, greatest, gulf spill, how easily do you think this process happens? The third, and one of the two most important reasons (and probably the least understood reason) is that oil is a GLOBAL market. It's not a U.S. market, or a North America market. Oil drilled here doesn't automatically stay here, and oil drilled overseas doesn't automatically stay overseas. What does this mean? If Germany has to pay $150/barrel for oil produced in Eurasiafrica, then that means they are willing to pay $150/barrel for oil produced in the Gulf of Mexico. If Shell can sell it's barrel of oil for only $100 to a refinery in Texas, and it costs Shell only $30 to ship that barrel of oil to Germany, then Shell is going to ship that barrel of Oil to Germany *EVERY SINGLE TIME* and make an additional $20/barrel profit. In order for texas to get that barrel of oil, they have to be willing to pay at least $130. Of course, we all know that demand for oil in the short term is nearly perfectly inelastic, while demand for oil in the long term is very inelastic - Now in layman's terms: As the price of gasoline goes up, your willingness to buy gasoline very likely does not go down - or if your willingness does go down, then as the needle of your fuel gauge starts pointing towards "E", your willingness again goes back up - and it's not like you saved anything by not buying gas for those extra two days, because now you have to put those extra two days back into your tank on top of what you would have bought anyways...effectively: you're going to buy gas, no matter the cost. The fourth point, the second of the two important points, and another misunderstood point. The oligopoly known simply as "OPEC" (Oil Producing and Exporting Countries). OPEC exists solely to maximize the profits of its members. It's like a homeowners association: we don't have legitimate rule, but we're going to punch you in the ovaries if you don't listen to us. (This is part of the reason that I threaten the very idea of a homeowners association whenever it is brought up/mentioned/etc.) So OPEC, like I said, exists solely for profits. A little over a decade ago, when demand for gasoline was in the middle of it's skyrocket, OPEC decided to try an experiment: What happens if we simply don't produce enough gasoline for everyone? Well their experiment was a resounding success: they found that when they produced a little less oil, they made a LOT MORE PROFIT on that oil. They did it a few more times, reducing the quotas for the member countries until they found that they could maximize their profits while saving more of their reserves. Think about it: if you made 1000 widgets a day and people paid $0.99 per widget, but then found out that people would pay $4.00/widget if you only produced 750/day because they wanted the widgets that bad - there's no way in hell you'd make 1000 widgets a day. You'd go for less work = more money every single time. Now: the misunderstood part about OPEC: No NON-OPEC countries are big enough to replace demand for oil - not singly and not combined. If we all produced oil at 200% capacity and OPEC completely ceased oil production, the price for gasoline at our pumps would probably jump to well over $10.00 or $20/gallon. By this reasoning, OPEC gets to set the price of oil at whatever makes them the most profit (by limiting supply), and there's nothing you or I can do about it. If we can produce enough oil here to pay only $0.50/gallon at the pump, but Germany is willing to pay $500/barrel + shipping for that oil, then we're going to pay $500/barrel for that oil here at home. It ain't redistribution if you own it.